A truss is a structure that is very often used in civil engineering, such as bridges, steel buildings, towers and roof structures (as seen in the image below). They also appear in many mechanical and aerospace structures such as cranes, offshore platforms, space structures, and so on. Trusses consist of straight members that are connected to each other at the two ends of each member. All members of a truss structure are connected together with pin joints, such that for the purpose of the design of these structures we assume the joints can not carry or resist any moments. Typically, the joint connections are formed by bolting or welding the end members together to a common plate, called a gusset plate (pictured below). All external loads acting on a truss are assumed to be acting only at the joints, and therefore, all members of a truss are two-force members. The individual members are not subjected to bending moments and shear forces but are subjected to only axial forces that is either compression or tension. Usually, trusses are made of steel, timber and very rarely from concrete and aluminum. Why are they so efficient over long spans? Trusses are much more suitable over long spans then solid beams due to the direction and type of force that they contain. 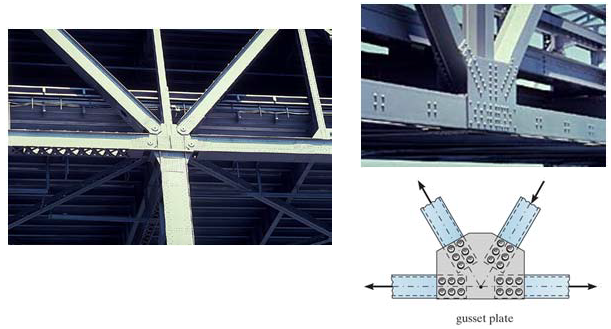 As mentioned, truss members are connected through pin joints that mean there is no internal shear and moment forces, and the forces are applied axially to the member. Alternatively, in a truss structure the forces are axial. This means, that each truss member has the same intensity of axial force across the entire member (uniform compression or tension). Therefore, the force and stresses are being distributed along the entire member. Because of this, truss members can be lighter, and will still have higher load capacity and more efficiently used cross-sections. 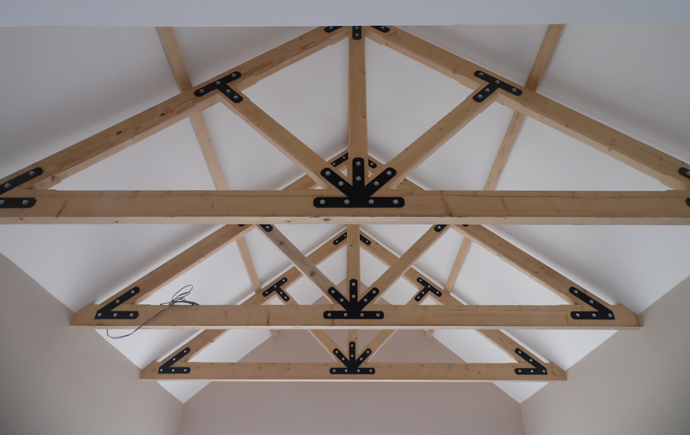 Generally, the overall efficiency of a truss is optimised by using less material in the chords and more in the bracing elements. This is particularly more useful over longer spans over alternatives such as concrete beams or prestressed concrete. Truss members can remain lightweight and material usage can be reduced by using a system of steel members over one large concrete section. Beam members tend to sag when loaded and are more sensitive to increases in span than the requirment for increased strength. Pre-Stressed Concrete is an alternative structure for long span structures. Although it is a simpler structure, it is far less efficient than a truss. Pre-stressed concrete members must withstand enourmous bending stress, and only worsens as the span increases. So the longer the span, the more concrete that is required. Cable Stayed Bridges An effective design for long spans, however still require a large use of material to support the cables. Cables are as efficient as truss members, since they transfer force into tension, however the external structure to support this system might be inefficient and heavy. Trusses are generally used as roofs structures of large span buildings and also in bridges, towers, cranes and walkways. They have higher load capacity and more efficiently used cross-sections. This is because their pinned connections transfer forces axially and there are very little bending moment and shear forces in the members. Members are more efficient in carrying axial loads since the stresses are evenly distributed, rather than transverse loads which are concentrated. This combination makes truss systems more efficient than single-member alternatives (e.g. prestressed concrete). Trusses allow engineers to create large open spaces with fewer materials. Using fewer materials also allows contractors to build cheaply. Feel free to start modelling or designing your truss structure using SkyCiv's Free Truss or Roof Rafter Calculator.